The UKIP party chairman in the constituency where leader Nigel Farage hopes to become an MP has said he "deeply regretted" his past membership of the National Front. He also told the BBC it was "really depressing" to be reminded of his past. Councillor Heale did not want to do a broadcast interview, but told BBC political correspondent Chris Mason: "I obviously regret what I did." "It is really depressing," he added, to be reminded of his past. Mr Heale acted as Mr Farage's election agent in 2005 when the UKIP leader ran, unsuccessfully, for Parliament in Thanet South. Media captionNigel Farage: "I've taken on yet another very big challenge - but one that I relish"
To expel him "would be contrary to natural justice", he said. 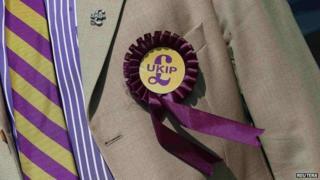 Can UKIP build on its successes in 2014?